Slow Cooker Chicken Noodle Soup is the perfect for cold days! Hearty vegetables, noodles, chicken, and delicious broth are the perfect combo. Weight Watcher friendly- 2 SmartPoints! Nothing is more comforting when it’s cold outside, or when you have a cold, than a big bowl of chicken noodle soup. The flavors and the warmth in the soup are just so perfect and comforting that nothing else compares to it! Eating this soup as an adult really brings back so many childhood memories. Whether you are under the weather, or just need a taste of comfort, my Slow Cooker Chicken Noodle Soup is just what you need. Chicken and vegetables cooked to perfection mixed with hearty noodles in a soothing broth are guaranteed to warm your soul. Delicious and low fat! This is a Weight Watcher friendly recipe and each serving only 2 SmartPoints per cup. It’s no secret that soup is kind of my favorite thing right now. I’ve been making a soup, chili, or stew at least once a week since September started. Maybe it’s the change in the seasons, or the desire to have something that is comforting? Probably a little bit of both. If you have read some of my other posts you will know that my husband and I moved from Texas to Indiana about 4 months ago. While we have each other (and our dogs), I have my moments of missing family and friends. It’s only natural, right?! Don’t worry… my husband and I are going to visit family over Thanksgiving in the Northeast plus we have a really big trip planned in December to go back to Texas and visit our “Texas” family! Chicken Noodle Soup is an iconic soup that everyone has likely eaten once in their life. Whether it’s cold outside, or you have a cold, chicken noodle soup is there to warm you up and make you feel better. I can totally picture the Campbell’s Soup commercial in my head right now where the little boy is outside building a snowman, comes inside as the snowman, has soup and then melts away back into the kid. I love seeing those commercials now as an adult because I remember seeing them as a kid. As a kid, I don’t remember getting sick a ton, but when I did my mom would always give me chicken noodle soup. When I grew up and moved away to college, I remember always stalking my dorm room up with chicken noodle soup so that whenever I was home sick, I could eat some soup and feel better. Food is magic! A while back, my husband and I were talking about preparing for our first winter storm. We both work from home don’t necessarily have to leave the house, which is great for when it snows. For now, we don’t have to worry about shoveling snow or defrosting the car early in the morning. So, when we were talking about how we are going to prepare for the brutal winters that we will now experience (because we live in Indiana and not Texas), my mind immediately went to “what will we eat”? That’s usually what I think about… food. I anticipate that when it’s snowing outside and our heater is on overload, all we will want to eat is soup. On a side note, both of us are really excited for the first snow. We can’t wait to wake up, look outside, and see a blanket of white. He grew up in the Northeast but hasn’t seen real snow in years. I never really have! Not only am I trying to prepare for the winter (by building a collection of soups, stews, and chili) but I’m also trying to prepare for the day one of us gets sick. It hasn’t happened yet, but I’m sure it will. When that happens, I want to be prepared and have the best chicken noodle soup recipe on hand and ready to make. While Campbell’s soup is good, there is nothing better than homemade soup especially this recipe. When I was thinking about making this soup, I had to remember that *if* I do get sick, I need to have a recipe easy enough that my husband can make, and this recipe is that easy! While this soup could easily be made on the stove top, there’s something special about the soup cooking in a crock pot. The chicken has so much more flavor when cooked on low for 10 hours rather than on a stove top for an hour. The vegetables soak in all the flavors and are cooked to perfection in the crock pot. SO SO delicious and warming! 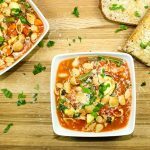 This soup is super easy to make (husbands can even make it)! Just dice up a few celery stalks, carrots, onion, and garlic and throw into the crock pot. Next add chicken broth, seasonings, and chicken breast. Let the soup cook on low for 8 or 10 hours. Remove the chicken and shred. The chicken is so moist and tender, it will literally fall apart which is exactly what you want. Finally, add the chicken back to the crock pot, add the noodles, and cook for about 7 minutes. 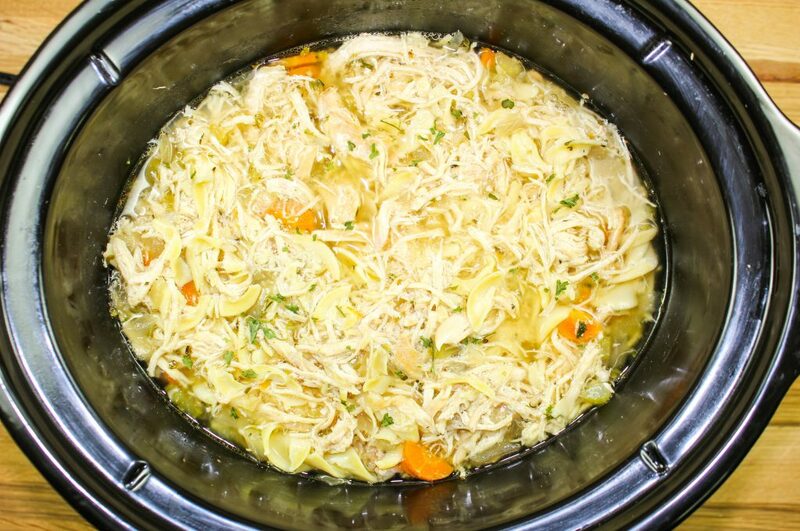 Whether you are under the weather, or just need a taste of comfort, my Slow Cooker Chicken Noodle Soup is just what you need. 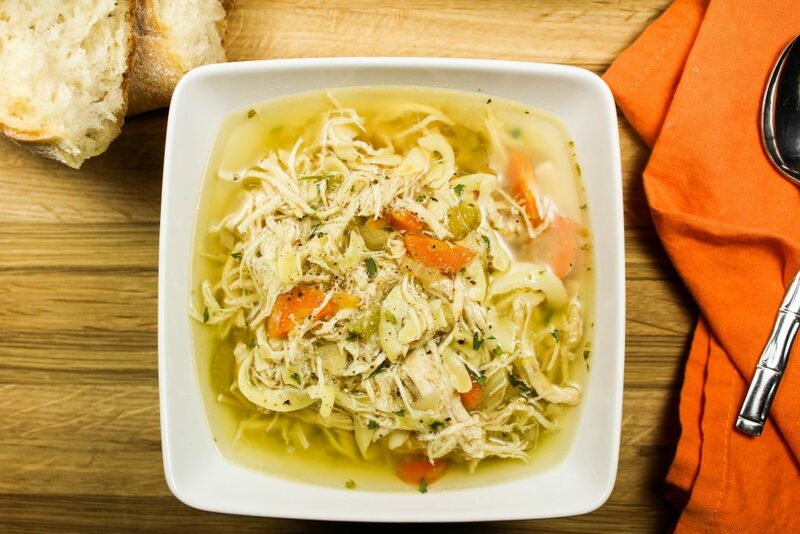 Juicy shredded chicken, perfectly cooked vegetables, noodles, and a delicious broth is comfort in a bowl. Easy to make and even easier to eat! Healthy and low fat so that you can have more than 1 serving! 2 Weight Watchers SmartPoints for 2 cups!! I hope you enjoy these *comforting* bites of flavor! Dice onion, garlic, carrots, celery, and add to crock pot. Add chicken broth, water, chicken breast, salt, pepper, parsley, oregano, and bay leaf to crock pot. Cook on low for 8-10 hours or high for 4-6 hours. Add shredded chicken to crock pot. Add egg noodles to crock pot and cook for 7 minutes. November 18, 2016 at 9:11 am I love anything in a crockpot. I hope you try this recipe out soon! Thanks so much for commenting Amber! November 18, 2016 at 8:58 am Oh I hope you feel better. This soup is perfect for that! Thanks so much for commenting Bridget! November 21, 2016 at 11:13 am Yum! I usually make chicken soup on the stovetop on a long slow afternoon simmer, but this looks like a great alternative for a busy day or when you're out of the house. November 21, 2016 at 11:20 am Yes, it's perfect for that Rachel :)!! November 21, 2016 at 11:42 am Thank you for posting this. We were looking for a good soup recipe last night. This one will fill the bill! 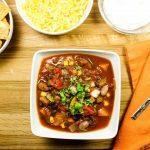 November 21, 2016 at 1:22 pm Crockpot recipes are my absolute favorite. I like to throw things in, forget about them, and then come back to a house that smells delicious! November 21, 2016 at 6:47 pm Oh my goodness. This looks like the perfect fall/winter soup. One of my goals this season is to make more soups, so I am saving this one. Thank you for sharing! November 22, 2016 at 5:07 am Yum! 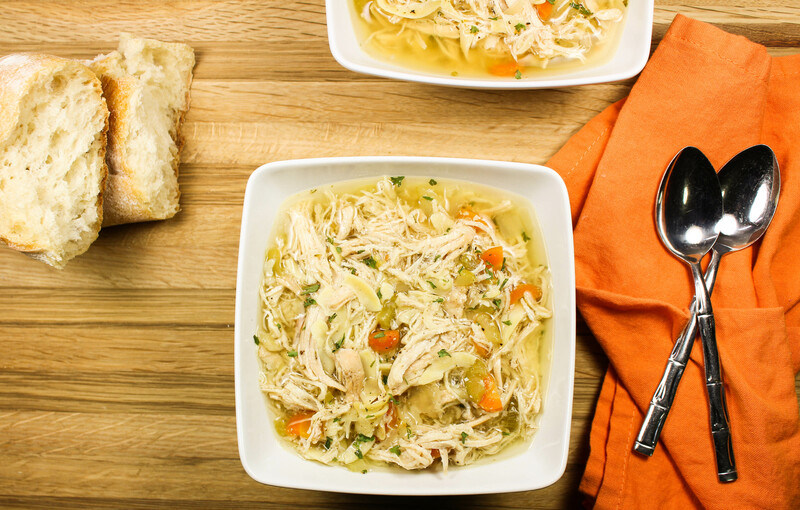 The only thing better than homemade chicken soup, is one that can be made in the crock pot. I'm definitely going to be trying this recipe very soon! Cait Weingartner recently posted...Gift Guide // For The Hostess. 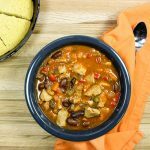 November 22, 2016 at 9:43 am Yes, this recipe is so much better because of the crock pot! Thanks for commenting Cait! November 23, 2016 at 9:58 am Thank you so much Yana! November 23, 2016 at 9:18 pm What size crock pot do you recommend for this? I have a small one (maybe 3qt) and then a 7qt and I'm not sure which to use! November 27, 2016 at 10:54 am Great question! I used a 6 quart crock pot. Thank you for commenting Karen! 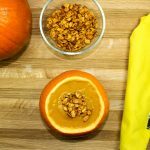 January 10, 2017 at 12:28 pm This recipe is one of our favorites this time of year. I can't get enough home made chicken noodle soup! There's nothing as good as a hot bowl of chicken noodle soup! January 10, 2017 at 3:51 pm Me either Leslie!! Thanks for commenting! January 30, 2018 at 4:02 pm Hi Lynette, It's two cups for 2 SmartPoints! May 1, 2018 at 9:52 am Found this delish recipe and you on Pinterest. Making it today. Thank you for sharing. May 2, 2018 at 9:21 am I'm so glad you found this recipe! It's one of my favorites!! November 14, 2018 at 5:51 pm Can i cook it on high for 4 hrs? November 17, 2018 at 11:30 am Yes you can!